Anthony enjoys spending time in the workshop, the kitchen, the garden, and out fishing. Many of his projects are featured in his yard. "Can I have a goat? Please?" Our daughter asked this question repeatedly for several years. The family menagerie already includes a dog, two cat, guinea pigs, a rabbit, fish tanks, a chicken coop, and a small garden pond with goldfish and koi, along with a horse that resides at a local stable. Living in a rural area allows us to keep a small flock of backyard chickens for collecting fresh eggs and raising baby chicks. We plant a vegetable garden every spring, and we grow a variety of fruits including strawberries, raspberries, blueberries and figs. We encourage our kids to spend a lot of time outdoors to connect with the surrounding woodlands and the local wildlife. But goats? Persistence pays off (along with good grades and demonstrating a strong sense of responsibility). She researched endlessly, peppering us continually with facts about goat care and the different types of goats along with their traits and their behaviors. 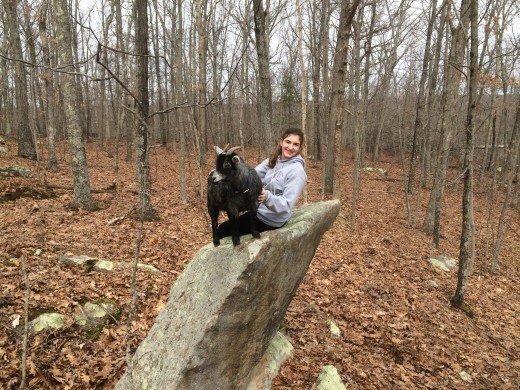 Her research led her to decide on pygmy goats, a small breed that is raised primarily for meat. And as we learned, some folks keep pygmy goats just as pets. 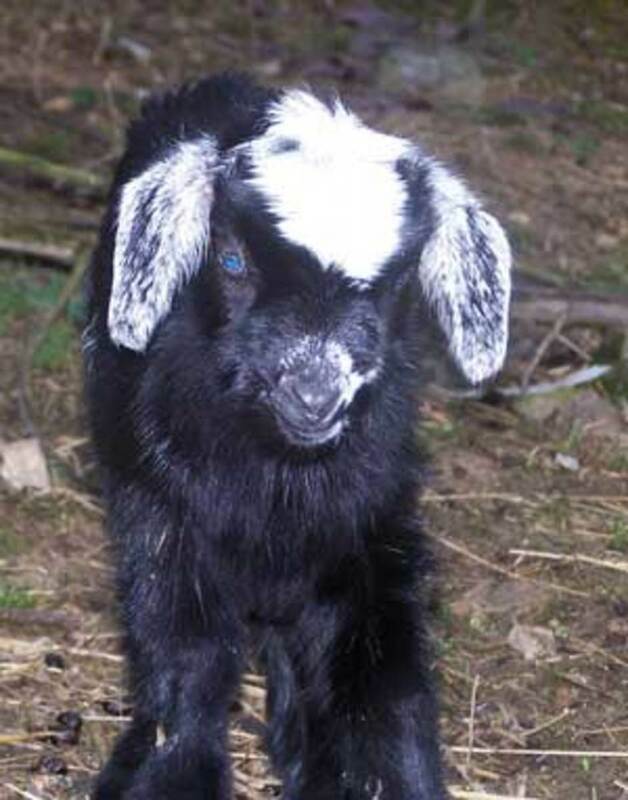 As fate would have it, a friend happened to know someone who breeds pygmy goats. Our timing was good, as her backyard herd had just given birth to about 20 little baby goats. The young goats were still several weeks away from being ready to leave their mothers, but we were welcome to come by and pick out a couple of baby goats. So now, we have two baby pygmy goats. Of course, we had to build a goat pen. These little critters are incredibly cute friendly, and I've also learned that pygmy goats can be fun and interesting pets! Say Hello to Oliver & Delilah! 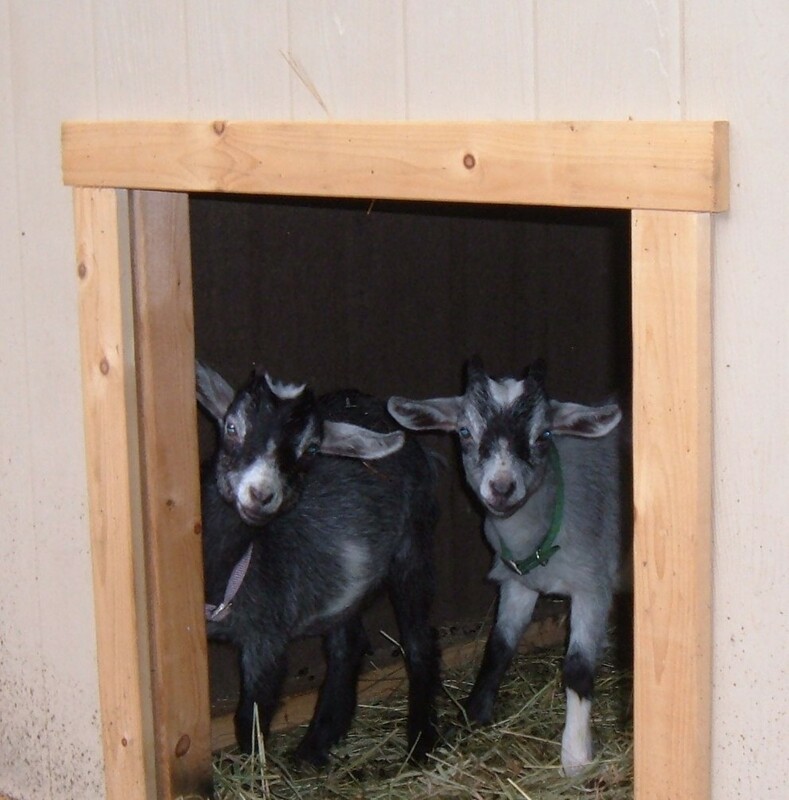 Oliver and Delilah are purebred Pygmy goats. 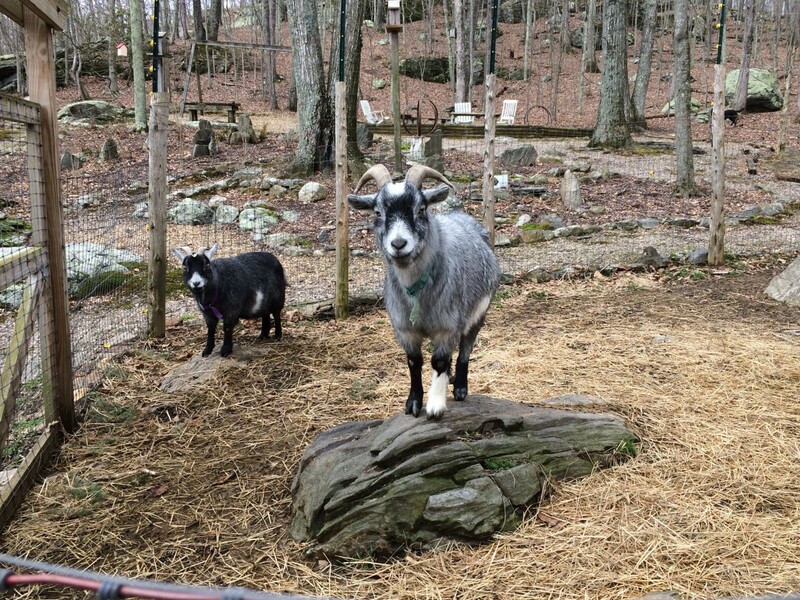 That's Delilah on the left, posing on a rock in their goat pen with her half-brother. The kids are around four months old at this point, about 14 inches tall at the shoulder and weigh almost 20 pounds. They are very, very cute. They are also affectionate, curious and surprisingly intelligent. The little goats quickly learned to walk on a leash, though they willingly follow us around the property, stopping to snack on leaves from both native and ornamental plants. The kids are especially fond of blueberry plants, both the wild and domestic varieties. Graham crackers are another favorite, and we use the crackers to lure the goats away from eating garden plants or to lead them back into pen. Goats have soft muzzles, gently taking the crackers from our fingers or eating grain from the palms of our hands. Oliver and Delilah love to be scratched around the ears and along the base of their horns, rubbing and pushing against you for attention. Resembling pint-sized mountain goats, they leap up and over large rocks as they scale the granite ledge outcroppings in our backyard to reach the tasty shrubs growing near the top. For chubby little animals, they can really run and show a lot of agility as they romp in the yard with our dog, Macy. The goats like to spar, lowering their heads in mock combat with each other. Oliver also likes to play with Macy, and they chase each other around the yard. If you're going to keep goats, you're going to need a goat pen. 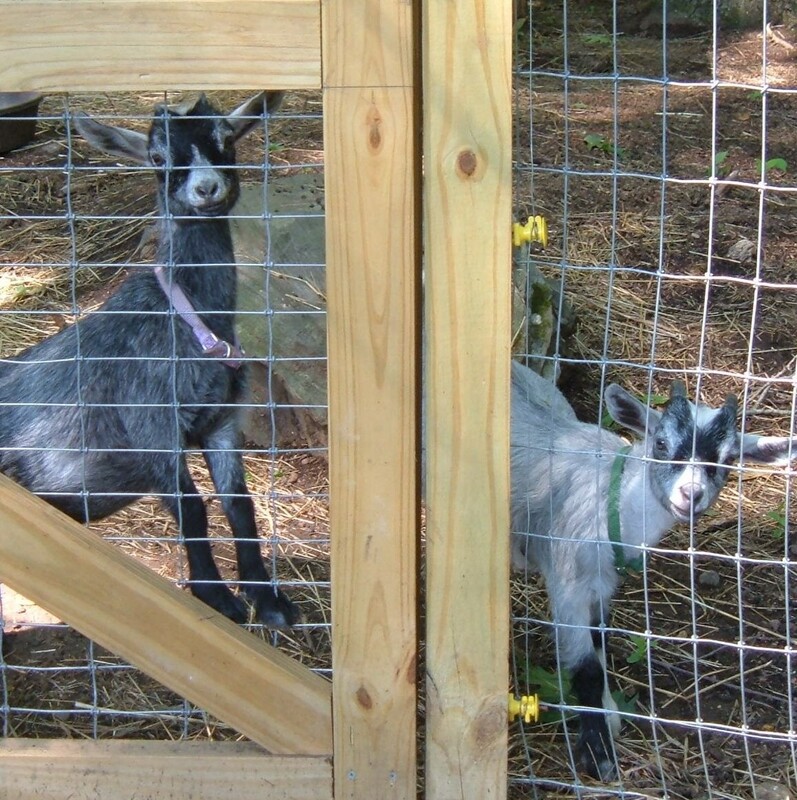 Our goat pen is approximately 20 feet wide and 30 feet long, providing Oliver and Delilah with lots of room to roam. We cleared an area towards the back of our property, behind the garden shed and alongside the chicken coops. A few large oak trees offer shade from the sun and protection from the rain. And of course, there is a goat house that they sleep in, with a sloped roof that they climb up on for a better view of the world around them. The goat house is approximately 3-1/2 feet square and about four feet high. We built a ramp at the back of the house to make it easy for the goats to climb up on the roof, and this has become one of their favorite resting spots. 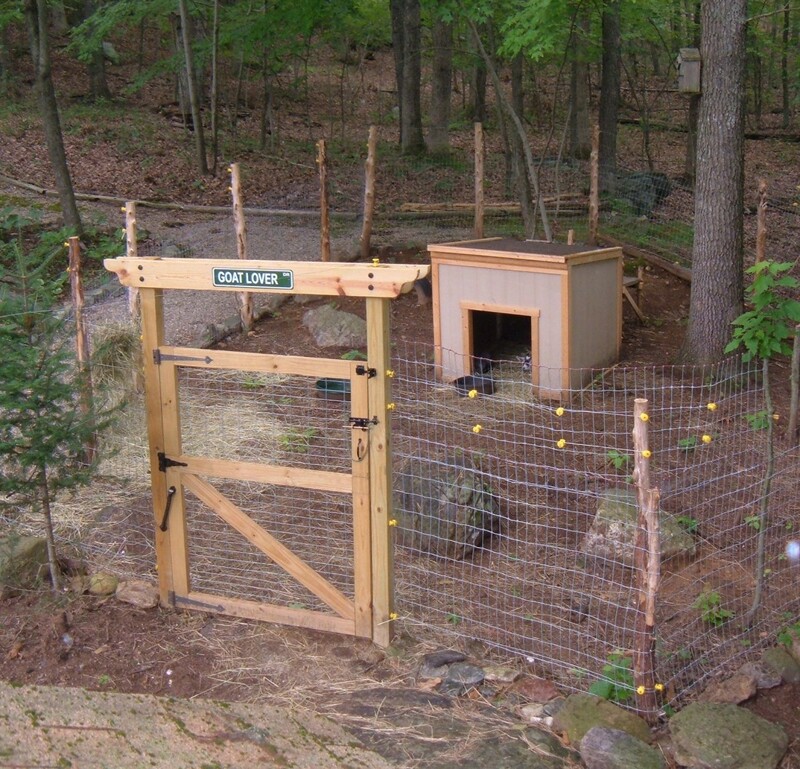 The goat pen is constructed from 8' cedar poles, spaced between 5 to 6 feet apart (depending on the terrain) and planted two to three feet deep into the ground. Cement secures the posts in place for added strength and stability. 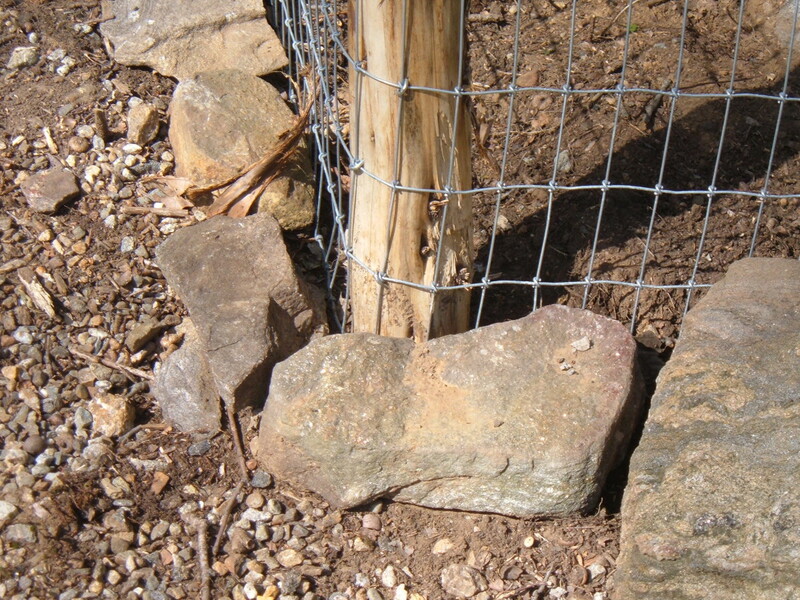 A layer of rocks and fieldstones around the base of the goat pen prevents dogs and coyotes from digging under the fence. The cedar posts must be sturdy enough to the support the heavy fencing that is pulled tight then nailed to the poles with fencing staples. We used a heavy gauge, woven no-climb fencing that is four feet high. A 100-foot roll of woven fencing was just enough to enclose the pen, with a little extra for making the gate. The woven fence was the most expensive part of the project, costing about $180 for the roll. Goats like to rub against things to scratch their bodies, and the woven fencing eliminates the sharp welds that could potentially injure the animals. Every pen needs a gate and since the gate faces into our backyard, we took a couple of extra steps to create an attractive entrance way. The goat pen opening is wide enough for a wheelbarrow to pass through (an important consideration when it comes to cleaning the pen). The entrance is flanked by 4x4 posts, sunk into the ground and secured with cement. The 2x6 header bolted across the top adds a decorative touch, and adds stability and strength to the structure. It also gives my daughter a place to hang her new goat sign. Three heavy-duty exterior hinges support the gate, and a large spring closes the gate automatically. 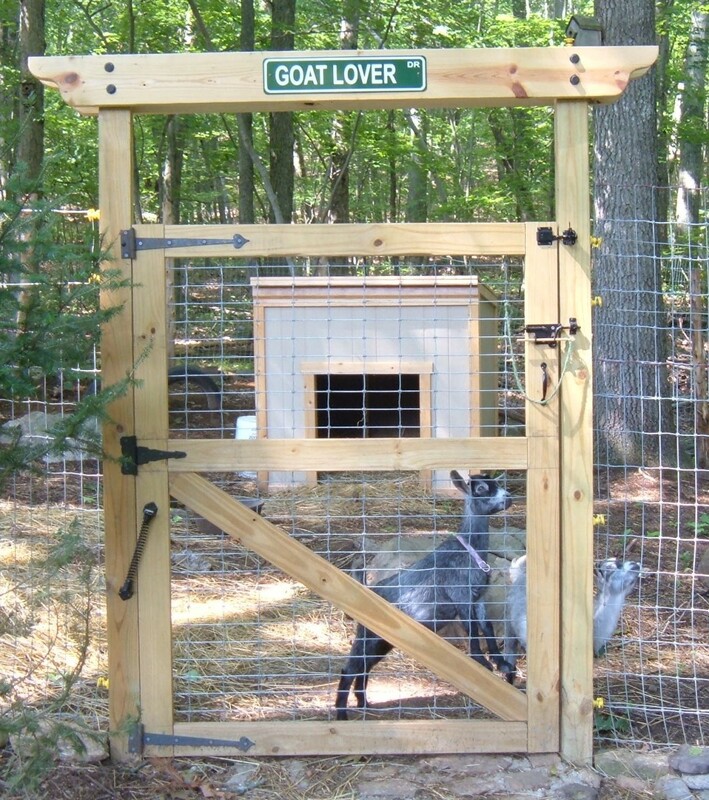 The gate latch in the upper right-hand corner also closes automatically, helping to keep Oliver and Delilah inside when entering the goat pen with food or water. A heavy latch secures the gate in the closed position. To keep dogs and coyotes from digging under the gate, we leveled the ground in front of the entrance and layered the area with flat rocks. A mortar of concrete holds the rocks in place and makes a nice pathway entrance to the goat pen. Goats need protection from the cold and rain, with wind blocks to escape from chilling drafts. Our goat house was built from exterior grade T-11 siding (available at most home centers) and we used simple 2x3 construction for the framework. The roof is sloped towards the back to allow the rain to drain away from the doorway. The 'floor' is simply the ground under the goat house, making it easier to keep clean. We raked the area level, covering the dirt floor of the goat house with a thick blanket of hay. Though it may look small, the goats are very comfortable in their little goat house. Every evening, they retreat to the safety and comfort provided by their little home. Oliver and Delilah do not like the rain and as soon as it starts to drizzle (or snow), the kids head for the shelter of the goat house. They curl up together for companionship and warmth. To help protect against predators such as coyotes, we added two rows of electrical wire above the woven fence, effectively increasing the height of the fence to nearly six feet high. 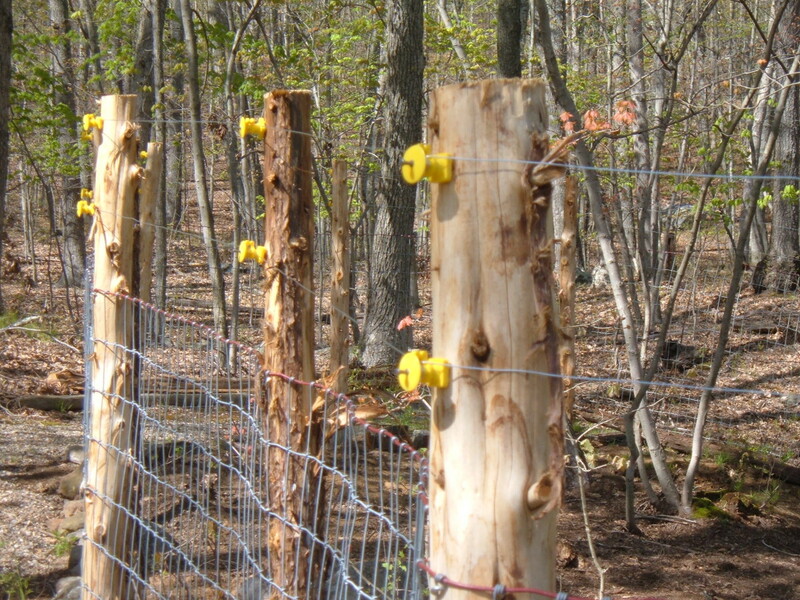 The electrified steel wire runs around the perimeter of the pen, and is secured to the cedar posts with yellow plastic insulators. Another row of electrified wire runs along the bottom of pen, along with a layer of field stone all of the way around the fence, preventing dogs and coyotes from digging under the fence line. The electrified fence sends a shocking pulse along the wire. 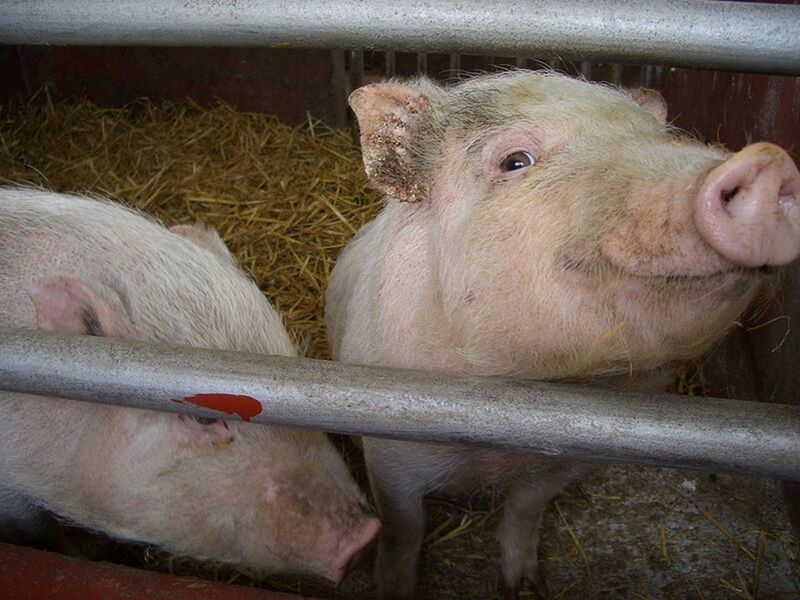 The voltage is low and only acts as a deterrent against any predator that tries to get into the pen. The shock will not harm an animal, but it has gotten Macy's attention a couple of times! One Goat is a Lonely Goat! Goats are herding animals, and should always be kept in pairs or with a small group. Oliver and Delilah stay together constantly and are seldom more than just a few feet away from each other. If Delilah climbs to the top of the goat house, Oliver follows. When Oliver decides it's time to visit the hay bin, Delilah trots along after him. If one of the kids wanders out of sight while browsing on bushes in the yard, the other calls out and looks around nervously until it spots the other, then trots over to its companion. There are over 200 different breeds of goats. There are over 250 million goats worldwide. More people drink goat milk than cow milk, and it is digested more easily. To most people, goat milk tastes the same as cow milk. Goats prefer to browse, eating leaves of shrubs and small trees rather than grass. Goats do not eat tin cans, but will strip off the paper wrapping to get to the tasty glue. 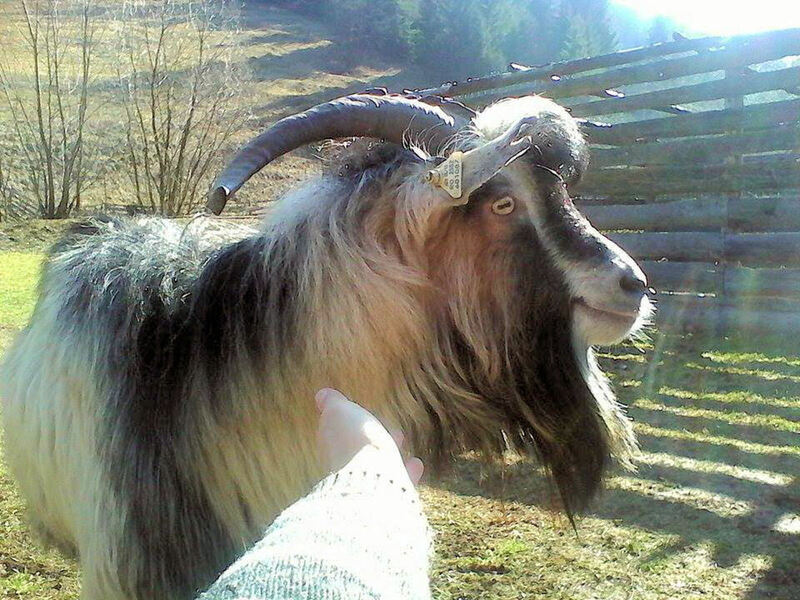 Both male and female goats can have horns and beards. Goats do not have any teeth in their upper jaw. A male goat is called a Buck, and a female goat is called a Doe. A castrated male goat is called a wether. Baby goats are called kids. While they are less than a year old, a young male is buckling and a young female is called a doeling. Female goats can begin to breed when they are about 8 months old. 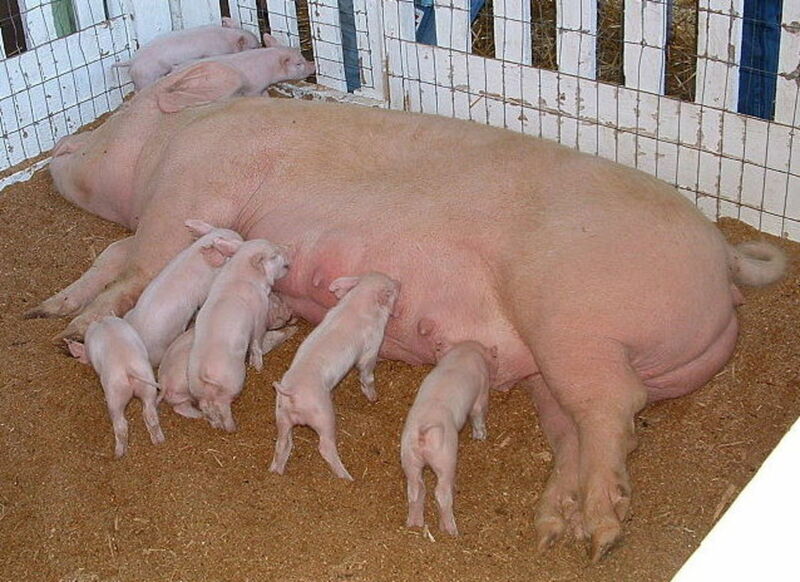 Most goat litters produce two kids, though litters of one kid or three kids are also common. Goats can live up to 12 years. Baby Goats Are Cute. They Are Also Energetic. Do Goats Make Good Pets? Perhaps, but they are not for everyone. And don't let them near the garden! Not sure... I've never met a goat. 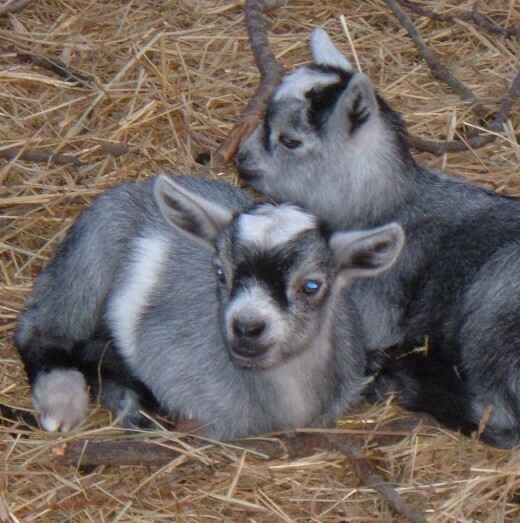 What's the price for pygmy goats? 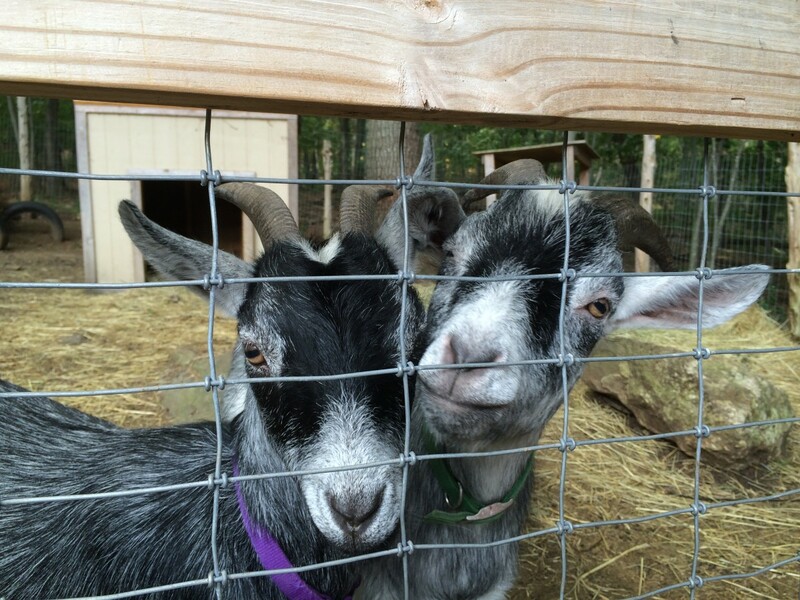 We purchased our baby pygmy goats from a local farmer, and we paid $75 for each goat. 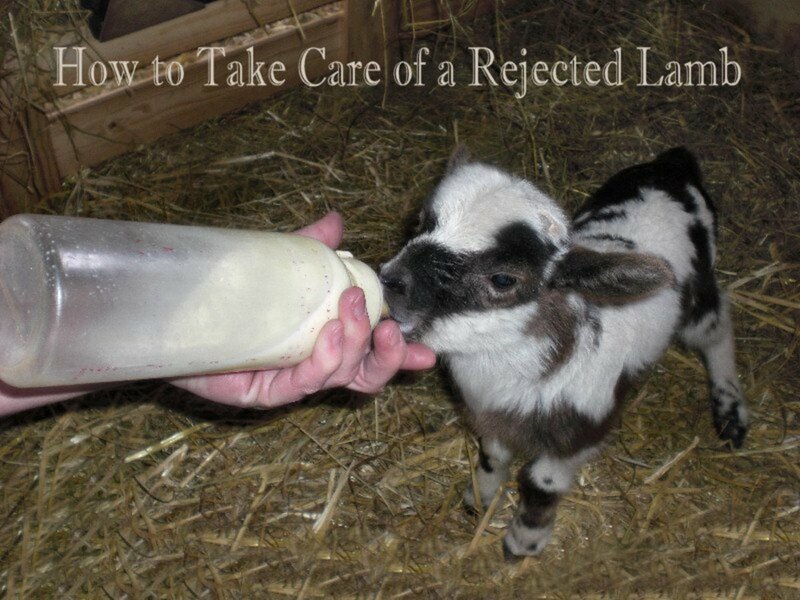 How do you deworm 1-year-old pygmy goats and how often should it be done? We took our baby goats to the vet when we first got them, and they go back every year for an annual check up that includes a stool sample. We get lots of second looks from other drivers who see the goats riding in the back of our SVU! How often can goats come into heat? Our goats are neutered, so we don't have to worry about Delilah coming into heat or Oliver getting extra rambunctious. Do Pygmy Goats Make Good Pets? 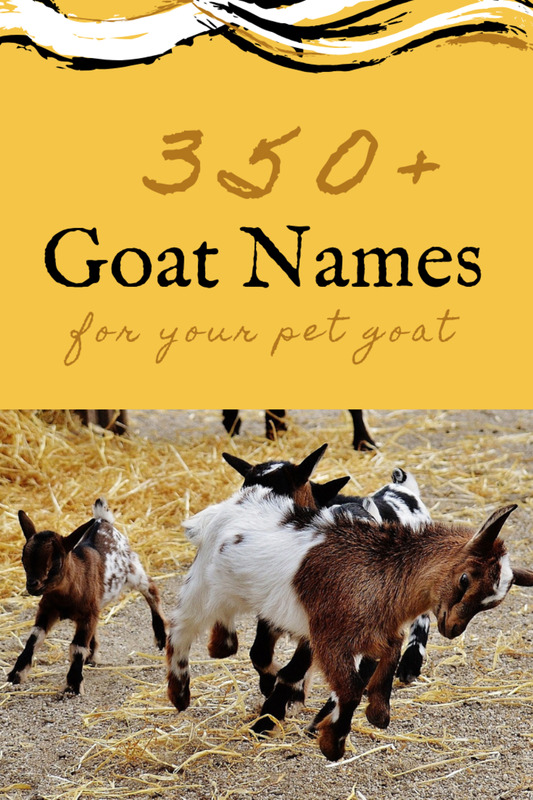 Goats—Farm Animals That Make Great Pets! I loved learning about Oliver and Delilah. They sound like wonderful pets. The instructions for building a goat pen should be very useful for people who are going to get goats. I'd love to be one of these people some day! I love goats ! I used to have to take one in the trailer when I would race my horse. He refused to get into the trailer unless his little buddy was in there first ! Holy smokes! Pygmy Goats ... oh my ... and pets, no less. So cute! 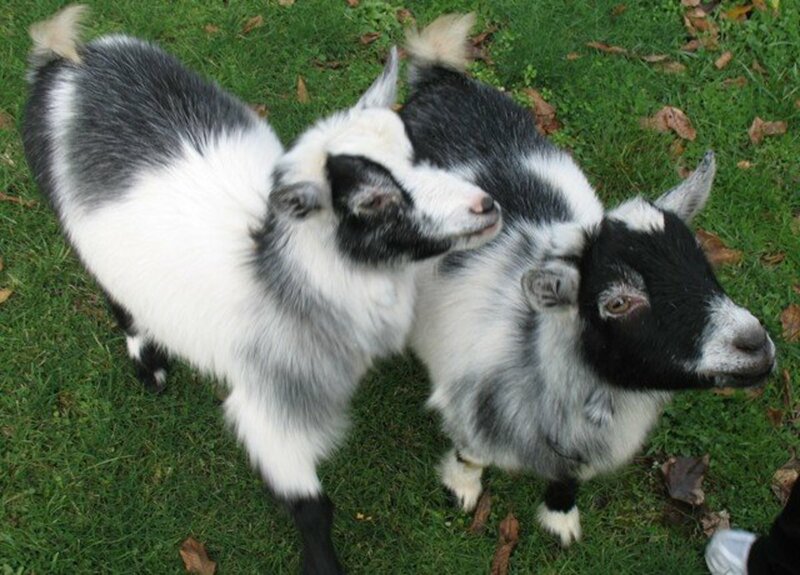 I've actually wanted Pygmy goats for a while, but I've never had the space. 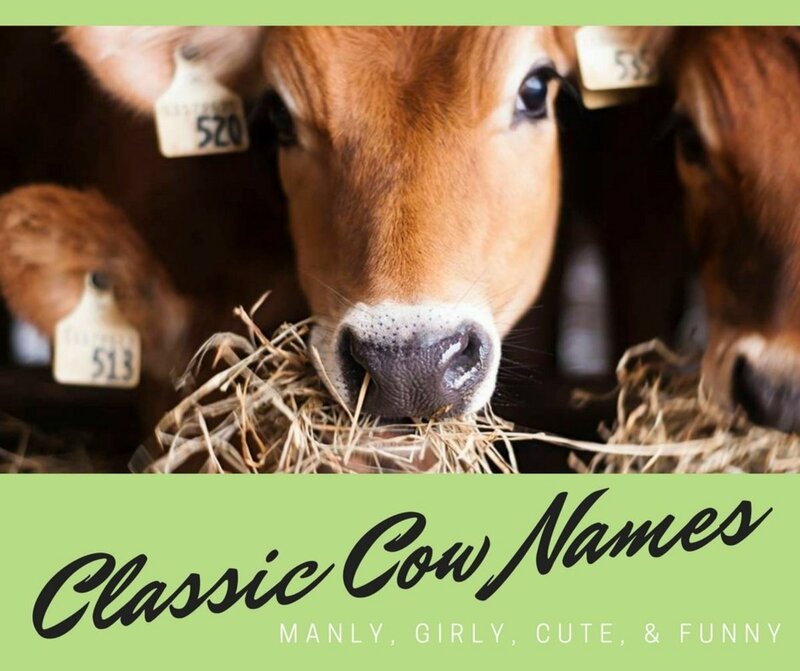 Someone I know used to raise dairy goats and loved the critters. Thanks for all the pictures and detailed pen photos! Too cute. Goats are adorable. Okay, so now you have me wanting some goats. My menagerie won't be complete without them. Your daughter made a great choice. 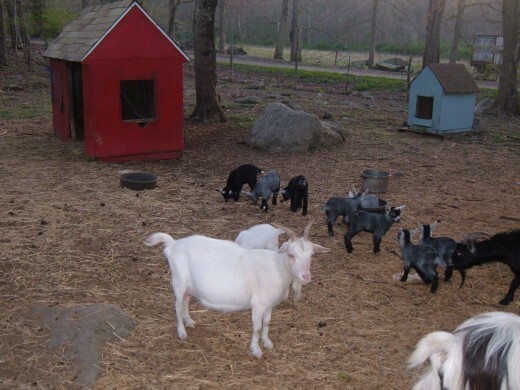 Looks like your goats have quite the wonderful homestead. Great lens! 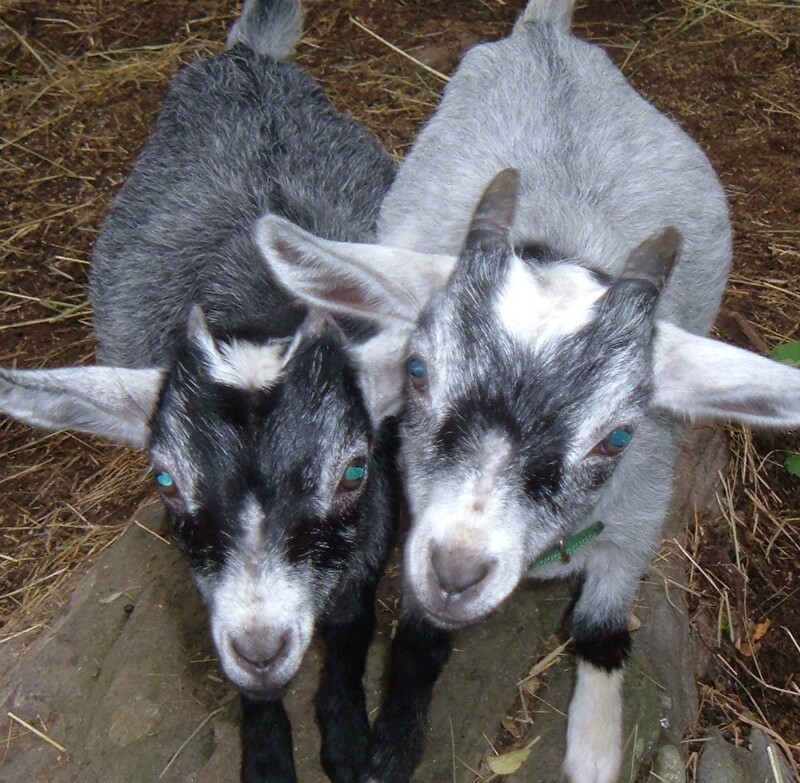 My brother had two pygmy goats to control the vegetation on his Oregon property; they were great pets too. But a cougar ate 'em. This is a great lens with great info; I like your goat house. I once had a pet pygmy goat and he was a wonderful pet. Bucks was also a splendid friend to my dog Tidbit. I was in a pet store once and there was a pygmy goat in there that was 4 weeks old. It was the most adorable thing I had ever seen in my life! Then it "baaaahd" at me and I was in love. But he wasn't for sale. I don't think I'm ready for them just yet as I have a toddler and a newborn plus a cat, four red earred sliders and two rabbits, but maybe someday!